Our Exclusive Designs were voted a 2018 Favorite by Brides Magazine! 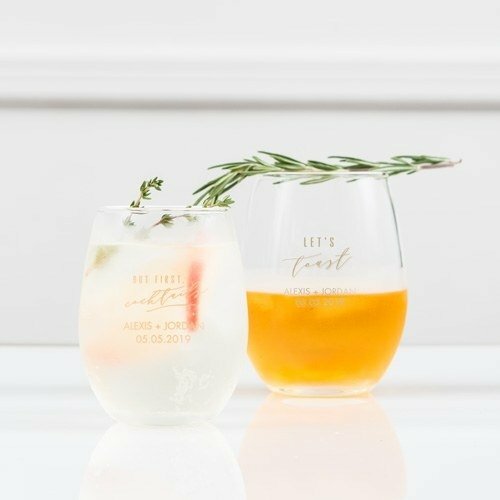 With designs only available at Wedding Favors Unlimited, these beautiful and versatile, these unique glasses can be used for your cocktail hour, for toasting the happy couple, or even a unique way to present dessert! The affordable 9-ounce stemless glasses are 100% customized with either your choice of color, personalization. We hear they were "very happy" because "I was worried that we may lose a couple due to shipping" but they arrived "without any damage". The glasses are described as "high-quality" and "sturdy" and the "printing they use on the glass is crystal clear(haha)". "Our guests loved the glasses and I would definitely order these again, especially if you have anything wine-themed". These are "perfect for cocktail hour" or "a great tabletop decor for our 50th anniversary" On shipping, they tell us the wine glasses "were packed twice" so they "held up to some serious manhandling". Others say "I recommend ordering a 3-5 extra because you just never know what happens during shipping" and "consider it a very small insurance payment." Dimensions: Measures 3.75" h x 2.5" in diameter at widest point, and approximately 2.25" in diameter at the top. These wine glass favors are Made in America and come bulk packed. Before you say "oh my" to Shipping Prices...don't forget we're shipping heavy glass! We appreciate your understanding. There's an extra fee of $45.00 to personalize this Custom Stemless Wine Glass Favor. Can I get the glass engraved? I'm sorry we do not have engraving option for the Custom Stemless Wine Glass Favor. Can I submit my own design to be printed on the glass ? How many ounces are these stemless glasses? It is a 9-ounce Custom Stemless Wine Glass Favor. Would it be possible to print 3 colors on the stemless wine? If so, what is cost? Thanks! I'm sorry, we can only print with one color.